ARCHIVE : 2016 : 2015 :: 2014 :: 2013 :: 2012 :: 2011 :: 2005-2010. This years Hanukah was celebrated at our premises with a record number of guests. Chance to light candles on our hanukia was given to our new members after our President Mr. Fogel lighted the shamash candle. Our youngest were delighted with presents that were given to them and our senior members with the excelent servings delivered from our synagogue. Watch a video on our YouTube Channel. Recorded by our member Dragana Djerić. Our exhibition on the establishment of a volunteer firefighting society in Zemun was shown in Budva, Montenegro at the fifth world gathering of Jews known as the MAHAR. Also our film about Jakov Čelebi was presented. During the program more than 80 accompanying books were distributed. Famous TV Pink journalist Mladen Mijatovic hosted numerous guests in the Jewish Community Zemun. The reason for socializing was his membership in our community. Mladen talked about his Jewish origin as well as about the reasons why he decided to join the JC Zemun. Accompanied by Mladen was his life companion Dea Djurdjevic. She thanked us for accepting Mladen for our member and stressing that he was very happy about that. 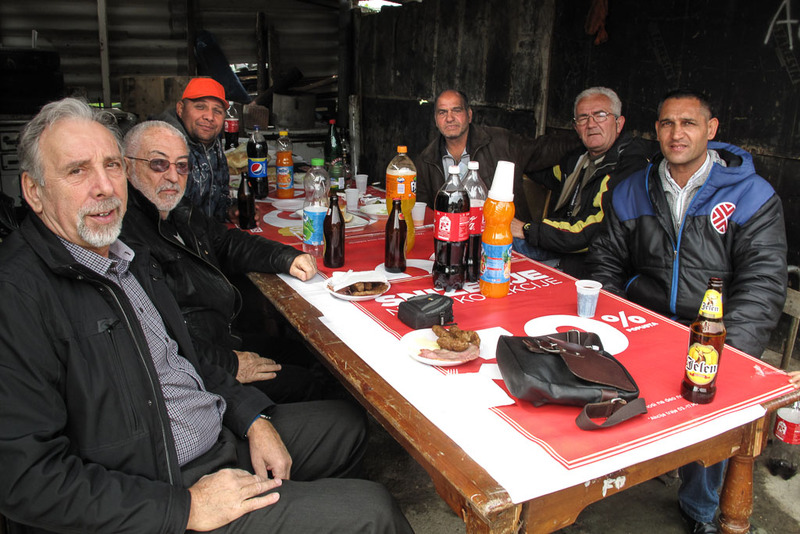 Members of the Jewish municipality of Zemun celebrated the 5778th anniversary of the birth of the world with the traditional symbols the shofar, apples and honey. It's not so common that we are getting new members into our community. This celebration was even "sweeter" because our brother and our new member Mladen Mijatovic was present. After Nenad Fogel´s introduction he addressed our members. In his inspired speech Mr. Nećak spoke about this holiday and the coming Yom Kippur. The celebration continued with servings and music played by Nikola Salacanin. The Jewish Community in Zemun was host to a two-day international conference of the women’s sections of Jewish Communities in Serbia and the region. Attendants at the conference from Serbia were women’s sections from Belgrade, Zrenjanin, Pančevo, Sombor, Kikinda and Subotica. Those from Novi Sad, Niš and Priština did not attend the meeting. The epithet “national gathering” was merited owing to the presence of representatives from Macedonia, Montenegro, Bosnia and Herzegovina and Croatia. The Croatian Community was represented by members of the women’s sections of the Jewish Community in Osijek and those who came from Bosnia and Herzegovina were members from Sarajevo. This extremely important gathering was supported by JDC. The diligent activists of the Zemun Community women’s section welcomed the guests within our Community rooms with a bountiful spread of homemade delicacies. Upon the refreshing meal for all guest travelers, although some had arrived in Zemun a day earlier (from Skopje and Sarajevo), the guests were welcomed by the President of the women’s section Erna Kovačević and the President of the Jewish Community in Zemun, Nenad Fogel. The conference symbolically named “The Next Step”, apart from a very interesting itinerary had for its main subject the problem of the “Fourth generation”. The meeting began with the viewing of a screen recording of the speech of Danijela Danon held in Zemun in 2009 under the heading “Women in orthodox Judaism”. Upon hearing the lecture all guests were shown the latest film from the Jewish Community in Zemun production dedicated to Jakov Žak Čelebi, the sole Jewish survivor of the Volunteer Fire Department “Matica” from Zemun. The afternoon program began by a visit to the exhibition “The Participation of Jews in the Development of Volunteer Firefighting in Zemun” on show at the Atelier & Gallery Čubrilo, accommodated in the Millennia Tower on Gardoš. The exhibition was put on show to mark the European Day of Jewish Culture. A short walk along Zemun’s famous Danube Quay and along Dubrovačka Street, once called Judengasse, as it was almost entirely populated by Jews, the guests once again arrived at our Community premises. The President of the Women’s section of the Jewish Community in Zemun, Erna Kovačević, opened the discussion on the subject of the “Fourth generation”. Almost all of the attendants took part in the animated discussion that ensued by presenting their views concerning the solutions to the problem. A unanimous conclusion was brought that the answer lies in the engagement of the entire family (mothers primarily) who have to enable the fourth generation to take a proactive engagement in Jewish faith and tradition, coupled with the support of their Jewish Communities. All the participants of the Conference agreed with the point reached that such discussions concerning the problem are obligatory in order to preserve a sound and viable future for the Jewish Diaspora living in the territories of former Yugoslavia. 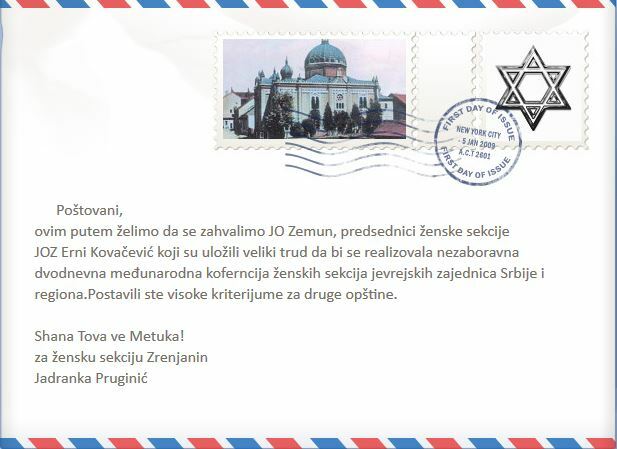 The views expressed unanimously concerning this problem will be contained in a mutual announcement that shall be put on Jewish Community in Zemun’s site. Once the discussion was concluded all participants received appropriate presents, handmade by our member Matilda. The day which abounded in various activities was brought to an end by a gala dinner inside the Synagogue, which will function for another year for its Zemun patrons as a restaurant of Serbian cuisine. From 2018 the Jewish Community in Zemun shall open inside the Synagogue premises its “Religious and Cultural Center Theodor Herzl”. The second day of the Conference began by welcoming special guests in the premises of the Jewish Community in Zemun. The Israeli Embassy in Belgrade, Serbia, Ambassador’s Deputy - Ms. Dženi Sedov, and the representative of the Administration for cooperation with churches and religious communities, Mr. Gavrilo Grban, accompanied conference attendants for a stroll round the Jewish Cemetery. The author of a separate edition about the Jewish Cemetery, which is available on the Community’s site (www.joz.rs), Nenad Fogel, spoke to his guests the about the basic data concerning the Cemetery. He accentuated the fact that both the grandfather and grandmother of Theodore Herzl are buried in Zemun’s Cemetery. By placing a wreath in front of the monument dedicated to all members of the Zemun Community who perished in the Holocaust, he once again brought to memory the brutal deaths their loved ones met with in the death camps of Jasenovac and Stara Gradiška. The wreath was laid by Erna Kovačević, President of the Women’s section of Jewish Community Zemun and Ms. Mira Panić, President of the Women’s section of the Jewish Community Federation in Serbia. During World War Two the Jewish Cemetery served for burying victims of the mass murders of Staro Sajmište Camp inmates. In the small space of the Cemetery more than 6500 antifascists lie buried, victims who, upon the closing of the Sajmište camp for Jews, were placed inside the same premises which were then renamed Collective Camp Zemun. The memorial was raised on July 4, 1957, at the initiative of the Savez boraca NORa Zemun. As a gesture of respect to all these victims, the Ambassador of Israel in Belgrade deputy, Ms. Dženi Sedov and Gavrilo Grban laid down a wreath. Upon the visit to the Cemetery the guests were shown some ten of our editions dedicated to the perishing of Zemun Jews, but also to those who shared the same fate from the Republics of former Yugoslavia and each guest received a book according to their choice. Special interest was shown for our book “Righteous Among The Nations, Serbia” which we had dedicated to all the good people, who during the Holocaust saved Jewish lives in the territory of Serbia and who were awarded the Medal of the Righteous by the State of Israel for the humanity shown to those in distress. The line of cars containing our guests then left for the Zemun Quay where we were to hold our final Conference event – a cruise along the Zemun Danube bank. Once we sailed off, our guests were welcomed by the Ambassador’s Deputy, Dženi Sedov, who spoke of the role of women in contemporary Israeli society. The mere fact that the Israeli Embassy in Belgrade is led by two women is evidence enough that the State of Israel is dedicated to gender equality. Mr Gavrilo Grban spoke of the role of women in the light of historical events contained in the Torah. Upon these speeches the guests were taken to the upper deck of the vessel “Sirena” where they could enjoy the musical program of Nikola Salaćanin, one of our fellow Zemun citizens. The final part of the cruise was reserved for MRs Kenan Mandra who spoke about the kosher diet to the audience. The fact that he is a Muslim speaks plainly of the tolerance of Zemun’s citizens to all who live in it. A doctor of sciences, nutritionist, he is famous for propagating non- invasive liposuction. As a symbolic gift to the Women’s section of the Jewish Community in Zemun, he promised to administer special check-ups and free therapy in his clinic. From the year 2004, the Day of Jewish Culture has been observed throughout Europe. The Jewish Community in Zemun regularly takes part in this important event by presenting one of its latest projects. This year we staged the exhibition “The Participation of Jews in the Development of Volunteer Firefighting in Zemun” in the “Atelier and Gallery Čubrilo“. The exhibition is dedicated to Jakov Žak Čelebi, Zemun’s single Jewish firefighter who managed to survive the Holocaust. We are indebted to Mr. Đorđe Aćimović. who saved his legacy, namely documents and photographs that shed light on Čelebi’s life; a life which, generally speaking, was absolutely dedicated to volunteer firefighting. For the requirements of this exhibition we have also made a film about Jakov Čelebi, encompassing his life story, with the famous actor Goran Sultanović as narrator. The exhibition opening ceremony started with pupils of the Zemun School of Music “Kosta Manojlović”, Andrija Sekulić playing the flute and Igor Filipović the accordion. The guests present at the exhibition opening were welcomed by exhibition author Mr. Nenad Fogel, Eng. Josef Žamboki from Israel and Mr. Đorđe Aćimović. The privilege to ceremoniously open the exhibition was given to the President of the Zemun Municipality, Mr. Dejan Matić. In his address to the gathering he pointed out that Zemun has always been a multinational and multi- confessional environment and that the Municipality of Zemun has always supported all activities undertaken by the Jewish Community of Zemun in the past. It's 75 years since the deportation of Jews from Zemun to the harshest death camps in Europe, Jasenovac and Stara Gradiska. We gathered to remember the names of our loved ones in front of the monument raised in memory of our members. Egon Lyon, a guest from Israel, said the Kaddash for the victims. President of the Jewish Municipality of Zemun, Nenad Fogel, welcomed all the attendees. A member of the Jewish Municipality of Zemun, Aleksandar Necak laid a wreath in front of the monument. At the end of the commemoration, the member of the Executive Board of our community, Vladimir Mijatović, read out the names of all the victims. Marking of the 73rd anniversary of the deportation of Jews from Senta in Auschwitz, Jewish Community Zemun displayed the exhibition "Vanished in the Holocaust Zemun" at the gallery Thurzó Lajos in the Senta City Musem. On the occasion of an exhibit director of the City Museum, historian Attila Pejin spoke to the visitors. He underlined the importance of fostering a culture of remembrance to all victims during the Second World War. On the fate of the Jews from Serbian visitors were reminded ba Aleksandar Nećak and the exhibition author Nenad Fogel. The Electoral Assembly of the Jewish Community of Zemun was held on Sunday April 23, 2017. Before the beginning of the work, the Assembly gave a tribute to all the members of the Jewish community in Serbia who passed away during the past period by a minute of silence. The President of the Supervisory Board of the Jewish Community of Belgrade Doc. Dr Dejan Popov welcomed the members of the JC Zemun in a short speech and wished the successful work of the Assembly. The Assembly made a number of important decisions related to the future work of the JC Zemun as well as electeon by secret ballot all the organs of the JC Zemun, which will operate the activities of our community in the next four years. 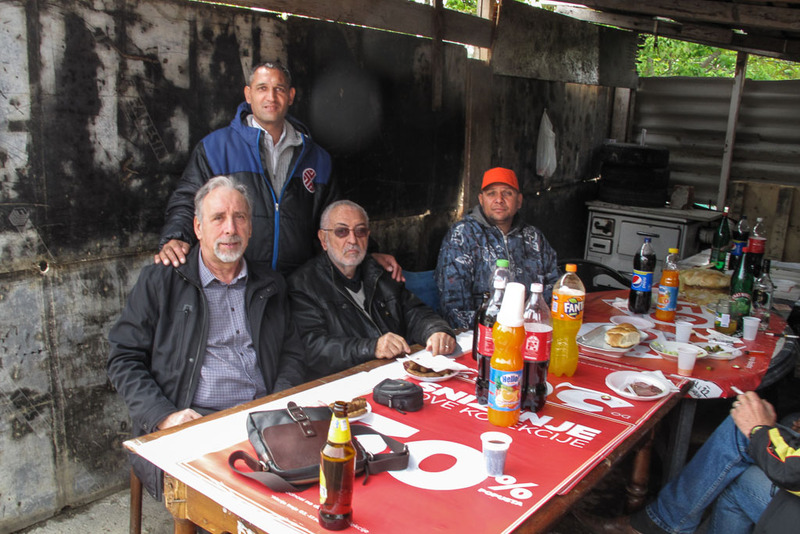 At the invitation of Severdan Alijević, President of the Roma Society, Romani Hakaja - Roma Rights, Aleksandar Nećak and Nenad Fogel of the Jewish Community of Zemun attended the celebration of the World Day of the Roma in the Roma settlement "Grmeč" in Zemun.. The Roma Society "Romana Hakaja - Roma Rights" is an active participant of the project "I don´t want co-life - I want a common life" which is being launched by the Zemun Jewish Community from the last autumn. Severdžan Alijević will attend lectures on tolerance and the creation of conditions for the joint life of minorities in several primary and secondary schools in Zemun, next to Dr. Žarko Korać, Philip David, Alexandar Nećak and Nenad Fogel. With the traditional feast the Jewish Community of Zemun celebrated a great holiday of Pesach (Passover). Our guests were welcomed by the President of the Jewish Community of Zemun Nenad Fogel. With the appropriate speech of the feast he invited all to do even more to preserve our tradition and religion. In the name of the holiday everyone drank a "sufficient" number of glasses of red wine. We look forward to mark next holidays in our Synagogue with the service of our valuable rabbi. For the first time since the end of World War II, members of the Jewish Community in Zemun gathered in their Synagogue to celebrate the most joyous Jewish holiday of Purim. The "host" of the celebrations was the restaurant "Sač", tenants of the Synagogue. The building was returned to their former owners, the Jewish community of Zemun last year so they´ll have to move in the two years period. Inspite of that their staff was more than helpfull in order to make us feel good. Their orchestra who played Hava Nagila made particularly important contribution to that. The Jewish New Year of trees and fruits was celebrated in our community, beginning with traditional servings of southern fruits. With Nikola Salaćanin´s music performance we enjoyed having fun and warm atmosphere of this windy and icy night. Unfortunately, this year the president of our community was not with us to tell us more about this Jewish holiday due to his visit of a family on the summer hemisphere of the globe. He was successfully replaced by the community secretary Ria who provided catering in the holiday spirit: five kinds of very tasty salads and sweets.